There are frequently conjunction with the moon and one planet, but the moon and two planets, or two bright planets is even more special. June 20th had a triple conjunction of the moon, Jupiter, and Venus. 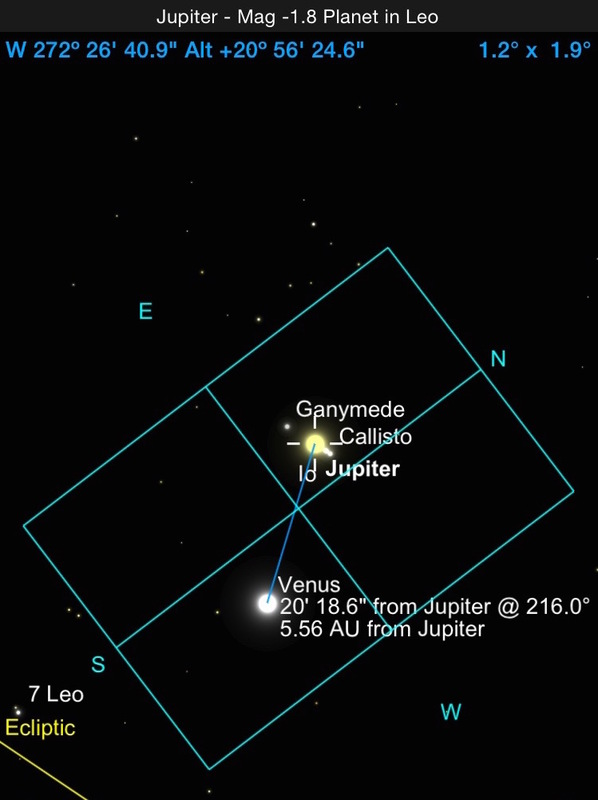 June 30th will have a very close conjunction of Venus and Jupiter – just 1/3° apart. That means even with a longer focal length telescope, both planets will be able to fit into the field of view. The June 20, 2015 Moon, Jupiter, Venus conjunction. Taken with a 70mm lens, 1/6th second exposure. Photographing a moon and planet conjunction generally calls for a wide field lens, not a telescope. The photo above was taken with a 70mm lens on a DSLR, but I’ve also taken photos with simple point and shoot cameras like the one below. Don’t worry about a tracking mount – a tripod is a good idea, but even hand holding a cell phone camera will do in a pinch! A Lunar Eclipse with Saturn to the left, and the bright star Regulus above from February 20, 2008. Taken with a Canon A710 camera on a tripod. Photographing a close planetary conjunction, or a close Lunar conjunction is very much like photographing a single planet. Because Jupiter and Venus are so bright, you won’t even need a tracking mount, because a short exposure will do the job. See How to Photograph the Gas Giants article for tips on how to do it. Get a photo of a conjunction? Share a link in the comments, or let me know on Facebook or Twitter!